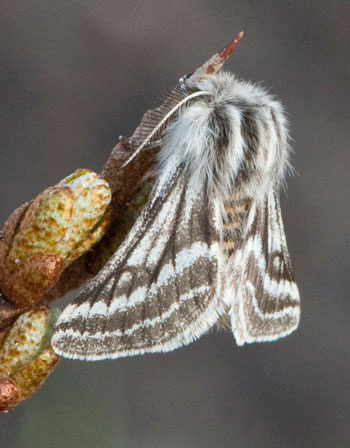 Over 2500 species of butterflies and moths have been recorded inthe British Isles and so far over 540 moths and 18 butterflies appear in the systematic checklist for the Outer Hebrides. This is not a definitive list; it does not include all the species recorded in literature or in museum collections, and although lepidoptera are well documented in comparison with other insects, new species are still being added to the list. Fourteen species of butterfly are regularly recorded on the islands: Large White, Small White, Green-veined White, Common Blue, Red Admiral, Painted Lady, Small Tortoiseshell, Peacock, Dark Green Fritillary, Grayling, Meadow Brown, Small Heath and Large Heath. The Small White is not as common as either the Large or Green-veined White with only a handful of records from the Uists and the island of Lewis. Speckled Wood has been recorded on Lewis since 2004, the Ringlet on South Uist since 2008 and the Orange-tip on Lewis in 2014. There are rare occurrences of the Clouded Yellow (migrant from southern Europe) and there have been two records of the Monarch (North American migrant species). This site currently illustrates and describes over 390 species and the catalogue will be up-dated as the website develops. The accounts of individual species can be accessed through the indexes of scientific and common names, by using the search page or systematic checklist. There is a separate list for butterflies.